Now Kochi can be seen by cycling. 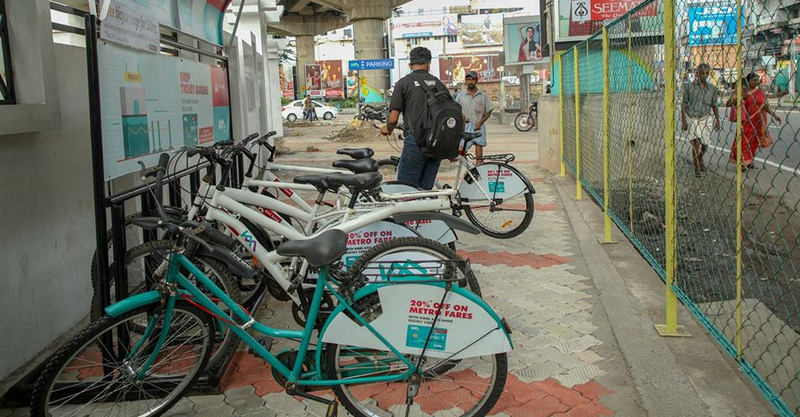 Kochi Metro Rail Limited (KMRL) is arranging a facility to roam around the city in bicycles. KMRL Managing Director Muhammed Hanish inaugurated the programme making common people to avail bicycles for city ride. The cycles will be available for just Rs 50 at MG Road, Maharajas, Lissie, Kaloor, Stadium, Palarivattam, Changambuzha Park and Edappalli stations as of now. The Metro officials said that the passengers have started using the facility. The Metro authorities also consider to grant ticket concession for those who use bicycles more. The project was implemented experimentally one year ago and it was successful in the three months as per reports. The cycles can be taken for rent after registering in Athi’s Bicycle Club (ABC). The registration can be utilized permanently. The bicycle can be used free of cost upto 100 hours a month. After that, Rs 5 will be charged for every hour. To take a bicycle for rent, send an SMS in the format RackCodeBicycle ID to 96455 11155. The code to unlock the cycle will be sent to the user’s mobile number. This will prevent theft of cycles also. In order to return the bicycles, send an SMS in the same format to 97440 11777. To take membership, send an SMS containing the name, address, email ID and job to 96455 11155. A bicycle can be used upto 24 hours a day. The club members will contact the mobile number of those who fail to return the bicycles even after the time. The registration of those who intentionally delay the return of cycles will be cancelled. The bicycles can be used only if the rules and regulations put forward by the cycle club are strictly followed. They will charge compensation in case any damage occurred to the cycles during use. The cycle can be returned after use at any rack in the 8 metro stations.